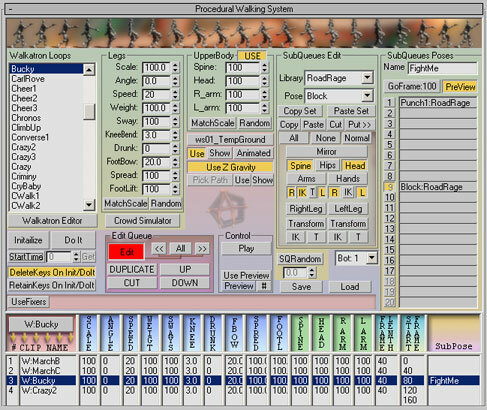 The Procedural Walking System or PWS creates lots of animation very quickly by stringing together customizable Walkatron Loops together. These walking cycle loops are part procedural and part keyframed animation. The result is a huge head start in the animation process, getting you closer to the more enjoyable task of finessing your final animation. Ground Objects ~ Characters can use a mesh surface for ground detection. You can even use multiple surfaces for a ground object collection. The ground objects can also be animated and the characters will stick to the surfaces as they move and deform. Snapshots can also be applied at timesteps along the PWS solution, giving you a great deal of control. Characters can also animate sideways or upside down.